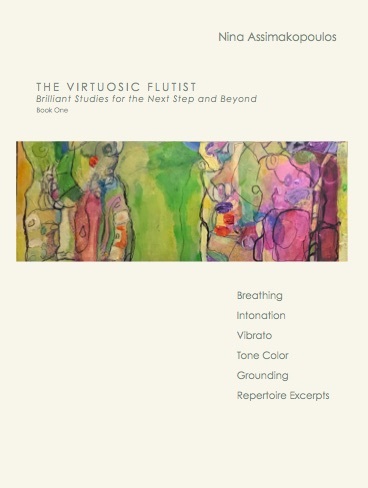 The Virtuosic Flutist: Brilliant Steps for the Next Step and Beyond is the first in a series of flute method books by internationally acclaimed flutist and pedagogue Nina Assimakopoulos. The series offers a concise and engaging approach to developing technique and musical artistry for all levels of flutists, from the beginner through the most advanced. Book One features pedagogical information and methods that develop important aspects of breathing and tone production with focus given to intonation, tone color, grounding, and vibrato. Preliminary exercises are followed by repertoire studies that contain excerpts from the most renowned lyrical passages in flute literature. These studies make use of a “triangle note” focal-point system unique to this series. Triangles placed under important structural pitches allow the flutist to explore focal points that are customized to the needs and goals of each performer. This method book is a must-have resource for flutists and teachers. It is sure to contribute to many hours of fun and inspiring practice! Internationally acclaimed flutist Nina Assimakopoulos is credited with over 84 international world-premiere performances and new music commissions and has recorded five solo CDs. She is active as a performing artist, masterclass and workshop presenter, and adjudicator at competitions in the USA and abroad. Join the Virtuosic Flute Community today for information on the book’s release, as well as updates on our upcoming social media giveaways, contests, and video tutorials by the leading flutists in the world! To pay/order through Venmo please message order quantity including the shipping or email address where you would like your books sent and remit payment to @Nina-Assimakopoulos.